Malva sylvestris is a species of the Mallow genus. 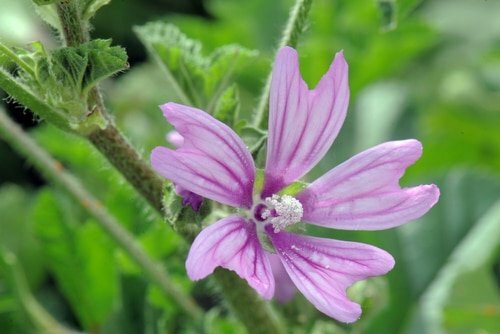 It's also called “common mallow” and “high mallow” or “tall mallow.” Pretty, bright, and typically some shade of purple, it's long been used as an emollient. Today, malva has found new popularity as a soothing and softening ingredient in sensitive skin formulations. Malva flowers make a great addition to five of our skin care products. This pretty flower produces a great moisturizer for sensitive skin. Native to Western Europe, North Africa, and Asia, malva sylvestris has showy purple flowers with dark veins, and usually stands about 3-4 feet high. A perennial plant, it likes to grow in fields or along roads and railroad tracks, and typically branches out and flowers in early summer. The flowers themselves grow in clusters of two to four, with a fringe of hair like projections. Historically, people liked using malva flowers to spread on doorways and weave into garlands for celebrating May Day. Today, malva is enjoyed in containers and as a border plant in flower gardens. Malva has a reputation for being soothing because its leaves contain a high level of plant “mucus,” making them perfect for use in a tea to soothe bronchitis, emphysema, sore throat, and cough. The tea also has a reputation for soothing stomach problems and calming intestinal inflammations, and is still used today to soothe these digestive and respiratory problems. The leaves and flowers also contain tannins, flavonoids, and vitamin C, all protective antioxidants that can help strengthen the immune system. Traditional uses of the herb also include the treatment of gallstones, kidney stones, kidney inflammation, headaches, and toothaches. Malva is best known in skin care for its ability to soothe dry, rough skin. If you're suffering from winter dry skin or similar skin issues, malva is the perfect remedy. The flower extract forms a soothing, protective gel that moisturizes skin. Malva is even beneficial for hair! It softens, conditions, and gives hair back its bounce, which makes it perfect for all hair types, but particularly useful for fragile and fine hair that tends to break easily. I love the soothing and softening benefits of malva flower extract, so I've included it into the following products. Have you tried malva in other areas of your life? Please share any tips you may have. My husband had a sore stomach for year he consulted many doctors and spend tones of money…..the malva tea every morning!!!!!! Its important to drink one cup of lukewarm tea in bed before getting up and roll for 10 to 15 minutes 5 minutes on the left side….5 minutes on right side 5 minutes on your bac……be patient it really works. He is so happy no more pain. Malva is very versitile, I enjoy malva in salads especially in early spring (right now!) when it is tender. I use as much of the stalk that I can, cut leaves and stalk into very small pieces and mix it in with my wild greens, which are mostly dandelion. This mixture with a bit of Radiccio Rosso, balsamico and red wine vinegar, EVO oil, a sprinkle of salt is a real treat. I add other wild greens but I don’t know all the names! I also very lightly simmer malva and simply eat it with EVO oil and soy sauce and really like it. It is good in soups as well, I don’t mind the “gooey” texture at all. I live in Umbria this time of year, great for foraging. I have just started making my own “lotion” and I used a decoction of malva for the liquid part, along with some witch hazel and rosewater, and the gummy liquid produced by flaxseed. I have not perfected it yet, but I did manage to get the liquid to emusiify with the olive oil and bee’s wax using borax. During our recent travels in Toscana, in a restaurant they served malva leaves together with our meat dish. It was quick fried. Then I tried it raw in my salad when I got back home. Not bad at all! After all natüre gave us these herbs to use in any way we can. I’m ready to try everything else with malva. I was wondering wether the flowers are also edible too. They’d look beautiful on a plate too.